This rollator is a walker with seat. It is ideally suited for elders who go on long walks, require balance support and need a ready seat to sit down when they get tired. The modern design and sturdy construction of the Comodita Rolling Walker make it one of the safest walkers in the market. Built to support weights of up to 400 lbs, it is tested and approved under the most demanding standards for rolling walkers. The unique design of its frame provides extra room for the feet to move, helping to avoid tripping and falling. It also allows the weight to be placed right above the wheels, and not on the side of the wheels, like most models on the market. Our rolling walker is built with the best materials available to ensure the highest safety you can find. This rollator is a walker with seat. It is ideally suited for elders who go on long walks, require balance support and need a ready seat to sit down when they get tired. 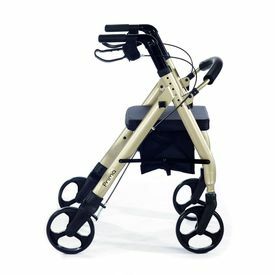 The modern design and sturdy construction of the Comodita Rolling Walker make it one of the safest walkers in the market. Built to support weights of up to 400 lbs, it is tested and approved under the most demanding standards for rolling walkers. The unique design of its frame provides extra room for the feet to move, helping to avoid tripping and falling. It also allows the weight to be placed right above the wheels, and not on the side of the wheels, like most models on the market. Our rolling walker is built with the best materials available to ensure the highest safety you can find. Weight Capacity 400 lb. 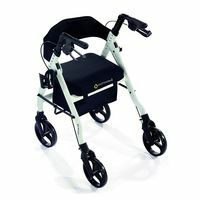 Built with reinforced frames and wheel support for increased safety, which makes this model approx.. 2 lb. heavier than similar models. Make sure you can comfortably handle a 19.5 lb. walker before purchasing. 8" Rubber Tires provide superior grip when brakes are applied, even on smooth tile surfaces, wood and carpet.